In part one of this series of articles on cholesterol awareness we learned some of the important facts that we need to know about cholesterol and how it can affect our health. In part two we’re going to learn about some healthy foods to add to the diet which can help to reduce cholesterol and support better overall health. Before we begin with a list of delicious, and good for you foods, let’s start by remember that if a label says the product is low-fat or fat-free this often means it’s been adulterated with chemicals that are probably not good for your health. Rather than looking for a processed food solution, use real foods which are delicious as well as nutritious. Omega 3 fatty acids – these are excellent for heart health. Unfortunately our modern diet tends to be very high in omega 6s and does not include nearly enough omega 3 fatty acids. Found in cold water fatty fish such as salmon, tuna, and sardines, omega 3s can also be found in walnuts and flax seeds. Try to have at least one serving per day. Fiber – adding fiber to your diet is a great idea not only for cardiac health, but also for gut health. Helping to form bulk for your stools it also provides pre-biotics, the food that the probiotics in your gut need to live. Found in foods such as buckwheat, barley, Voatmeal (old fashioned rolled oats, oat groats, or steel cut, NOT instant), oat bran, and beans, this is a delicious way to support your health. Three to four servings per day (not hard to do, a serving of beans is only 1/2 a cup cooked) is a great addition to your nutritional plan. Note: if you’re not used to eating fiber start slow as too much can cause intestinal distress. Olive oil – a delicious way to cook, dress salads, or create a dipping sauce, olive oil is a heart healthy food that you want to make sure is part of your pantry. Be sure to choose extra virgin, cold pressed olive oil as many “light” olive oils are highly processed and don’t have the same heart healthy benefits. Vegetables – sadly these days most people thing that salad counts as a vegetable. But what they’re really eating is nutritionally deficient iceberg lettuce with a few pieces of other vegetables, croutons, candy coated nuts or dried fruit, and drowned in chemically laden, high calorie dressing. If you’re going to have some vegetables why not have a real vegetable packed with nutrients. Colorful, tasty, and heart healthy choices include avocados (high in monounsaturated fats), broccoli, cauliflower, and Brussels sprouts(high in fiber and phytonutrients), tomatoes (lycopene is great for reducing LDL), and sweet potatoes (high in beta-carotene and fiber). Five or more servings per day. Polyphenols – found in a number of delicious foods this category of antioxidants is highly supportive of heart health and a very delicious way to support lowering your cholesterol. Green tea, red wine, grape juice, and cocoa products (such as dark chocolate or cocoa powder) are all high in polyphenols. Obviously due to caffeine and/or sugars these need to be eaten in moderation. Want to check the numbers you need to know for heart health? I can help with that, contact me for more information. Stay tuned for some heart healthy recipes. Baking is wonderful and something I love to do. Even more fun is to bake with kids. They’re so excited and fascinated by the process. Learning their way around the ingredients, how to measure, the wet and dry combining process; it’s a fun edible science and math experiment in the kitchen. This is one of my baking buddies, Miss A. She came over the other day with her brother, Mr. C. I had promised them that the next time they came over we would make cookies so that was our plan. As it turns out Mr. C’s idea of making cookies was to allow his sister and I to do all the baking while he played the part of Official Cookie Tester. And, might I add, he was rather impatient for those cookies to be done. Miss A and I got down to business, put on our aprons and got out my “Famous Chocolate Chip Oaties” recipe. Mr. C. wanted to know why they were famous, had they been on t.v.? Did someone famous invent them? I told him that it was a recipe I had created and I simply call them Famous because everyone who eats them really likes them and wants more. Needless to say he was less than impressed and informed me that unless they’ve been on t.v. they can’t be famous. Maybe I should send a box to Ellen? “But I want to taste everything.” she said. So I let her taste it. “Want some chocolate chips to wash that down?” I asked. We wound up making two batches of cookies the regular variety and the peanut butter variety. The recipe is below and we’re sure you’re going to enjoy it, just like we did. We love pancakes in our house. They are a great, easy to make, healthy, whole grain breakfast. Throw in some fresh fruit and maybe a little homemade Greek yogurt and it’s the perfect meal to start your day…filling, nutritious, blood-sugar balancing, and, most importantly, delicious. I love it when I find a recipe that is so perfect it doesn’t need anything else. This recipe is one of them. From my King Arthur Flour Whole Grain Baking book it’s a recipe that is a consistent favorite. I love the fact that it’s made from whole grains. Although I make my own oat flour by grinding oat groats you can easily make it at home by placing old fashioned oats in the food processor or blender and blending it until it reaches a fine consistency. If that’s more than you are willing to do you can also just buy it, both Arrowhead Mills and Bob’s Red Mill sell oat flour or you can get certified gluten-free oat flour from Legacy Valley or Cream Hill Estates. As a quick side note, oats do not have gluten in them. However they tend to be grown near, stored with or transported with other glutinous grains, most specifically wheat. Certified producers grow and process only oats, guaranteeing that there is no cross-contamination. One of the things that my family likes so much about this recipe is that it is very fluffy. You don’t realize that these are whole grain oat pancakes they are that light and airy. The bananas combined with the cinnamon and nutmeg make it a delicious way to start your day. I also like having another great recipe that allows me to use up any almost over-ripe bananas. Stir together the mashed bananas, butter, lemon juice and sugar in a medium bowl. Whisk together the oat flour, baking soda, salt and spices in a small bowl. Form a well in the center of the dry ingredients and pour in the wet ingredients. Stir the batter just until the dry ingredients are thoroughly moistened. Let the batter sit 10 minutes before using. Heat a nonstick griddle or heavy skillet. If your surface is not non-stick brush it lightly with vegetable oil. When the surface is ready spoon batter 1/4 C. at a time into the pan. Let the pancakes cook on the first side until bubbles begin to for around the edges, 3-4 minutes. When the pancakes are just beginning to set flip then and let them cook on the second side, about 1 1/2 minutes more. KA suggests you can sprinkle toasted walnuts over the batter just before cooking as an extra treat. 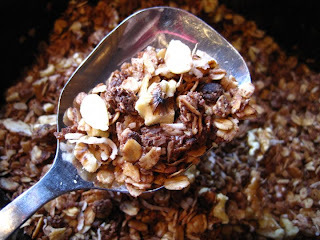 Today we have a special treat as my friend Christine shares her chocolate granola recipe. I’ve always loved granola because it’s a quick healthy breakfast, a great snack; it’s also quick and easy to make. One of the other great things about granola is how it can be changed around to suit individual tastes. The idea of making it in a crockpot, is a big “wow” because it doesn’t get any easier than that. With the addition of ground flax and coconut oil this recipe provides some great fatty acids (flax seeds have omega-3 while coconut oil has medium-chain fatty acids). These healthy fats help provide saiety, or fullness, which means it helps fill you up. Dark chocolate and cocoa provide antioxidants, especially epicatechin (found also in green tea) which protect against cardiovascular disease. Here’s Christine’s recipe, as she says it’s a big hit with her family, I’m sure it will be for yours as well. Mix well and heat on low all day, stir once in while. It’s another cold, wet, grey day here in Texas. A perfect day for breakfast pudding. It’s my newest recipe created because I was looking for a different way to make oatmeal. While I love a hearty bowl of oatmeal or an oatmeal smoothie or homemade granola sometimes you want something a little different. I decided that I would make something along the lines of a baked rice pudding but use oatmeal as the base grain instead of cooked rice. It came out delicious and is our new winter favorite. Although it takes 45 minutes to bake the leftovers are delicious (I actually preferred this on the second day). It makes 6 generous servings so it’s perfect for a brunch or weekend breakfast with leftovers for during the week. Having leftover fresh ground flour from the ricotta pancakes I decided to make some scones. Scones are great. Not as dense as muffins, the right size for a snack and, like muffins, very pliable to modification. Rummaging around the pantry and fridge revealed some strawberry yogurt and the last little bit of shredded coconut so strawberry-colada became the flavor of the day. Unfortunately I did not have any fresh or dried strawberries which I think would have made these scones even better; the currants worked well but the scones were a little light in the strawberry flavor. In the future I’ll make sure to have strawberries available the next time I want to bake these. In the past when I have made scone recipes using fresh ground flour I find that sometimes they are more dense than I’d like. Wanting to make sure these were light more fluffy I separated the egg. If you are using a whole grain flour you may want to do the same. Cooking and baking is always an adventure. Inspiration is all around you if you are open to it. There’s no real explanation for why or how ideas come together but I can honestly say that frequently it’s a matter of “oh gosh there’s X in the fridge and I better use it up.” Then I make something using that ingredient. Most of the time I make tried and true recipes, either my own or those from trusted cookbooks. Sometimes the inspiration is something I ate elsewhere that I really liked and have been given the recipe. Other times the recipes find me but I somehow can’t help playing with them a little bit. Such is the case with today’s breakfast. The inspiration was a click-through twitter post that brought me to Almost Bourdain’s (AB’s) blog, which I just discovered and like a lot. He credits his inspiration for this recipe to Bill Granger, I credit my inspiration to him. It’s kind of neat how that works, we’re all connected by this idea of ricotta in pancakes but we each put a slightly different twist to it; all of them, I’m sure, very delicious. My changes came about because I am trying to work more with gluten free recipes lately. These are for a few people I know who are faced with gluten sensitivity. It’s also, as always, inspired by what I have on hand. AB’s version calls for bananas and honeycomb. I didn’t have enough bananas but did have plums. Didn’t have any honeycomb either (and I miss my friends from CT who used to supply me with it) but I did have honey. Together with some breakfast sausage this made a great meal and is definitely on the repeat again list. I hope you like it too. Honestly these were fabulous. I would even consider serving them as a dessert by making the pancakes smaller and putting a dollop of creme fraiche on top with a dusting of cinnamon. My friend Tracy recently wrote in and asked what to do with the leftover steel cut oats she has. Her family doesn’t really like eating oatmeal for breakfast in the summer and she’d like to use up the oats rather than leaving them to sit until next winter. Steel cut oats are very coarsely chopped oat groats. They cook up hearty and nutty, are tasty and have a lot of fiber making them a great choice for those who eat oats. They can also be used for so much more than just oatmeal. I have used them in chocolate chip “oatmeal” cookies when I was out of oatmeal. I just substituted an equal amount of steel cut oats for the oatmeal. The substitution does change the baking time a little so you need to watch them a more closely. 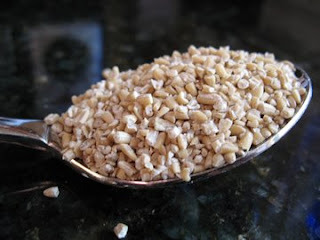 Another good use for steel cut oats is to grind them in a food processor or coffee grinder to get an oat flour which can then be used in a lot of different recipes. Oat flour tends to be lighter than wheat flour and has no gluten so it won’t rise well. This flour however is excellent for making cookies, biscotti, scones, muffins, and quick breads. My favorite use by far is to create steel cut oat pudding. I was introduced to this by a friend from England and it is a truly yummy dessert. It’s fabulous all by itself and absolutely wonderful when served with vanilla ice cream. Toast the oatmeal in a pan until lightly browned. Can be served warm, room temperature or cold. Option: Sometimes I vary this by substituting apple pie spice for the cinnamon and chopped dried apple for the raisins. Delicious!